Sending the right message to the right person at the right time is the key to success for many email programs. The Canadian Opera Company, the largest opera company in Canada, sought to implement real time email messaging to subscribers and send promotional emails during performance intermissions to encourage additional ticket purchases. See how the team created and implemented perfectly timed sends and coordinating phone follow-ups to achieve a 50% sles conversion rate from followup calls stemming from emails. The Canadian Opera Company not only has a strong repertoire in performances but also in marketing strategy. Producing operas through partnerships with other organizations around the world, the Company dominates the stage by being the most heavily subscribed opera company in North America—with around 70 percent of its audience being season ticket holders. “The marketing team runs its campaigns on very solid principles that have worked in the industry for the last 35 years, and they haven’t deviated very sharply from focusing on that subscription base as the principle way of driving sales,” said Rosalind Bell, interim director of marketing, Canadian Opera Company. Overall, Bell explained that the company doesn’t rely very heavily on single-ticket sales. Instead, it relies more on nurturing customers to attend multiple performances in a season. “It’s just a very efficient, well-oiled machine,” Bell explained. To keep that machine running and the opera sales singing, the team wanted to increase its number of season-ticket holders and grow its community of engaged COC customers. Previously, the Company was sending out welcome emails before performances and thank-you emails after the performance concluded to subscribers, but it wanted to take outreach to another level. In order to target opera-goers at the most opportune time, the team decided to reach out while they were attending a performance. Working with a vendor, the team performed analyses on propensity, which was “looking at what defined a potential season-ticket subscriber—so what behavior patterns or ticket patterns or geography would most likely result in that person subscribing the next year,” said Phil Stephens, senior manager, sales and customer service, Canadian Opera Company. Timing was the factor that most greatly affected the company’s success in converting a concert-goer into a season ticket subscriber. The goal was to take the momentum and excitement of attending an opera and shift it to the next experience, so customers return again and again. For this particular effort, the Canadian Opera Company targeted single-performance purchasers of two opening performances in the fall of the 2013 and 2014 season: La Bohème and Peter Grimes. When concert attendees purchased their tickets online through the Canadian Opera Company web site, an email address was required in the checkout process. After obtaining this information, customers were added to a specific track to receive perfectly timed email communications, based on when the performance they purchased took place. The team wanted to send a specific message to subscribers during the intermission of the performance they attended. To draft the email, the team developed a number of options and evaluated how they could fine-tune their message to be as relevant as possible, drawing upon an image of the opera they attended and identifying the opera in the subject line and the copy. 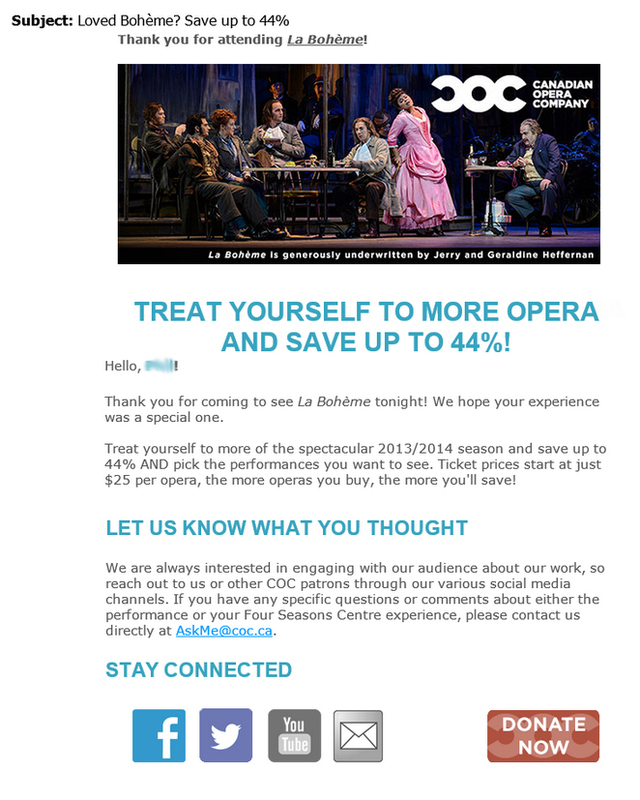 The resulting email that was sent during the intermission of the show they were currently attending invited subscribers to “treat yourself to more opera and save up to 44%&rquo; with a season ticket option. The email enticed opera-goers to see more performances with pricing options that coordinated with the number of additional operas purchased. The tone was friendly and invited feedback from the audience and presented opportunities to further connect with the company on social media. The following day, data was pulled from each email subscriber’s behavior in the email and was put into a unique customer profile for each individual. Opens and clickthroughs for the email were the top KPIs [key performance indicators] for the send, and based on that behavior, the customer would be scored based on his lifetime value, loyalty, engagement, and sentiment. During this time, the team was using this information to refine and perfect the email. Another email element the team worked to perfect was the graphic images in the send. “Something that we learned pretty early on is that full graphic emails didn’t get as much traction as something that had maybe a smaller graphic element but more text information in it,” Stephens said. The team had a theory as to why this was the case: Operagoers were most likely reading the email on their mobile device. “So they were viewing them on their BlackBerrys or other mobile devices, so the image may not have been displayed as cleanly as we wanted it,” Stephens said, adding that if text is used, it populates right into the email body. “It’s immediately more readable and a little bit easier for people to be able to browse through,” he said. The day after the opera, keeping with the momentum of engaging concert goers while their memories of the great performance they attended was still top of mind, the team reached out via phone to encourage additional ticket purchases for the season. “Our traditional telemarketing has been that we would maybe go through the run of an entire production and then pull a list and send that into the telemarketing room. So with this one, it ended up being much more immediate,” Stephens explained. The telemarketing team would start by thanking the customer for attending the show the previous night and asking about the experience they had. This included detailed questions such as how they chose the opera they attended and what they thought of the location of their seats. Then, the callers would talk about performances coming up and reference that savings factor the email recipient saw in the email sent during intermission the night before. Knowing what the customer spent on their tickets and which section they sat in helped the telemarketing team tailor offers to customers. “So, for example, if the ticket was $255, the offer might be those same seats for $191. So tying in that kind of value, or the cost around that, so it will illustrate the savings with them, was a great thing, too,” Stephens explained. “The sheer quality of the opera house itself as a venue that is able to showcase the art form in the best way makes it possible for everybody who comes to have a fantastic experience. It’s just, it’s been a huge, huge success,” Bell said. The perfectly timed emails coupled with the immediate followup has proved to be successful for the Canadian Opera Company. By the end of the campaign, 14 percent of all attendees purchased additional tickets for the 2013 and 2014 season. The average purchase was $309. Almost half (47 percent) of Peter Grimes attendees marked as high-propensity leads bought future tickets. Also, 15 percent of La Bohème high-propensity leads purchased additional tickets. Email response rates increased from 10 percent to 67 percent, and close rates for sales calls lifted from 15 percent to 50 percent. “Part of the success of the program has been capitalizing on that wonderful feeling that people have when they attend the opera on their way out. They have a consistently excellent experience of opera. That’s one of the best experiences that you have anywhere in the world,” Bell said. Seeing the achievements of this campaign, which was the first upsell program with such immediacy, revealed the benefits of leveraging digital marketing to the team. “That’s one of the good things about digital: You can change things on the fly relatively easily, and track the results because you’ve got so much data that comes through immediately or in a very short period of time after something launches,” Stephens said. In the future, they hope to continue this type of campaign and add more elements to the email, including a feedback survey and a way to showcase more fundraising initiatives. One lesson the team learned by performing a campaign dependent solely on timing was to ensure all of the people involved were aware of what their roles in the process are and to get everyone onboard to quickly engage with customers. “Just make sure that your systems people or your list managers are onside with it because there is a lot of coordination that’s necessary to be able to produce the leads and the lists in a timely manner, and so they really need to understand the value of that. I mean, we have come to very successful campaigns with it, so it’s worth the effort. It is labor intensive, but it’s certainly worth it,” Stephens concluded. © 2000-2014 MarketingSherpa, LLC., used by permission. As a MarketingSherpa reporter, Erin Hogg writes case studies featuring transferable principles and inspiring stories of marketers overcoming challenges, while spotlighting their successes. 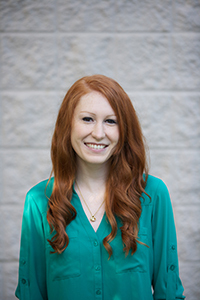 Before becoming a MarketingSherpa reporter, Erin served as the sole copy editor for all MECLABS brands, ensuring top-notch quality in all content ranging from articles and blogs to videos and presentations. In her free time, Erin enjoys playing video games, jamming on her bass guitar, and finding hidden gems on Netflix.